You guys are probably pretty familiar with this room cuz of all my holiday posts. Now that the floors are done I can officially call this room done. Many of you, however, don’t know what this room looked like when we moved in. Let me give you a clue: totally different, wouldn’t recognize it if it slapped you in the kisser. 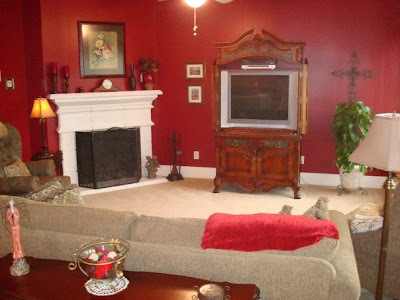 This is the living room as it looked when we made our offer. super de duper dark and, well, red. I’m all for red but the dining room was dark hunter green. aka Christmas house. to the max. And how it looks today. This is my petty, budgeted attempt to channel the living room from “Somethings Gotta Give” That movie with Diane Keaton. Check out that way more awesome house here. 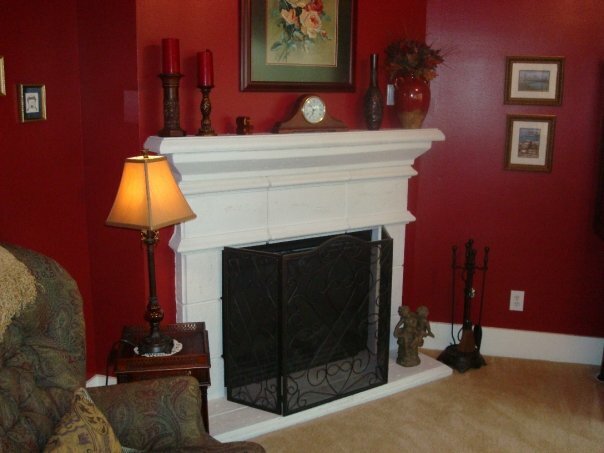 Shot of the fireplace when we made our offer. Needless to say I started priming this room the day we closed on the house. It took me 2 days, 3 coats of primer and 3 coats of paint to cover the red. I still see areas where I swear to jeebus I can see red shining through. Couch, Chair, Ottoman and Curtains: Ikea, duh. Coffee Table, White End Table, and Both Lamps: Target. Oars: Antique store in Osage, KS from our infamous road trip from TX to MN and back. Fireplace Screen: Garden Ridge. When I bought it on “please just take this off our hands” clearance it was olive green so I spray painted it navy blue. * Yes, my rug is small for the room. I didn’t want to cover too much of our wood floors. Plus I didn’t want too much yellow either. mmkay? ** The coffee table is too small too. That I DO want to fix. That pesky Husband and his “budget” are holding me back…. I’m working on it. ***These pictures are so hideous unedited. I apologize for subjecting your eyes to these icky pics. Wow, it looks great! Love that rug and the oars are fun. I painted over a red bathroom that was similar to that color and it was a huge pain, so I can just imagine how much work a room this big would be! Like you, I swore I could still see a little red taunting me through the lighter paint. Maybe it was just seared into my eyeballs, though, because no one else saw it. Ha. Very nice! I think you channeled Diane’s white interiors very well. Wasn’t that a beautiful house her character lived in?